For decades now, Levantine-Rûm who rejected Arabism have been left with only one valid ideological alternative, Pan-Syrianism. That is until recently, with the emergence of Antiochenism. However, with the development of this new alternative comes many questions. What are the ideological differences between Pan-Syrianism and Antiochenism? Are there any similarities between these two alternatives to Arabism? These are just some of the many questions Arabized and Arameanized Rûm may wonder at first glance of this new alternative ideology. It my hope to answer some of these questions within our community as to the ideological difference between Pan-Syrianism and Antiochenism. In order to lay to rest prevailing doubts many may have within the greater Levantine-Rûm community. In order to compare Pan-Syrianism and Antiochenism. We must first define what Pan-Syrianism is, which can only be done by looking at the only organization in the world which promotes it, the Syrian Social Nationalist Party (or SSNP). The three main tenets of which are a Radical reform of Syrian society along secular lines, a totalitarian-state ideology, and last a Greater Syria. Pan-Syrianism, however, is not a united school of thought, but rather has two competing forms, which could be identified as pragmatic and pure. These two approaches to Pan-Syrianism are divided on one single issue, Arabism. The first accepts it, while the second rejects it . For the Pragmatic Syrianist, Greater Syria is a part of a much larger “Arab” nation, and thus Syrians are ethnically Arab. While for the Pure Syrianist, Greater Syria is not part of a larger “Arab” nation, and thus not ethnically Arab . Traditionally, Pan-Syrianism has appealed to the region’s non-Sunni minorities as a means of leveling the playing field, and erasing historic discrimination. For non-Arabist Rûm, this has always been a clear ideological alternative since it offers the possibility of a uniting all Rûm under one state . The first, and most important ideological difference between Pan-Syrianism and Antiochenism is their definition of the Syrian Nation. Although both ideological schools of thought agree that the region’s people are suffering from an identity crisis due to occupation, colonialism, and sectarianism. 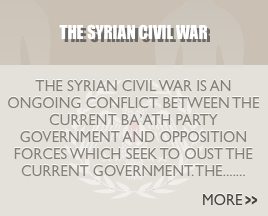 They have two radically different interpretations on the Syrian Nation. For Syrianists, the Syrian nation constitutes as its own ethnically homogeneous civilization, reaching back to the pre-Christian era all the way to the present. It draws exclusively from the region’s Semitic heritage . This is in contrast to Antiochenists, who view the Syrian nation as ethnically heterogenous, a melting pot of peoples and identities which doesn’t draw exclusively on the region’s Semitic heritage, but accepts and includes the region’s non-Semitic heritage as well. 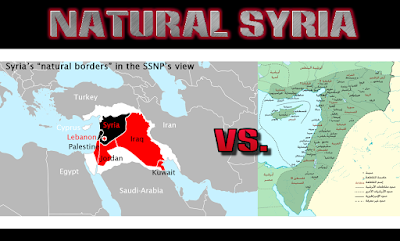 In the eyes of an indoctrinated Syrianist, Syria is an exclusively Semitic land, in which the Syrian people evolved as a result of the intermixing of ancient Canaanites (Phoenicians), Akkadians, Chaldeans, Assyrians, Arameans, Hittites, and Mitanni  . While for Antiochenists, Syria is a crossroads of Indo-European and Semitic peoples, in which the Syrians are not a single homogenous ethnicity, but a regional identity made up of multiple separate but equal ethnicities such as the Rûm (Antiochenes), Syriacs/Assyrians/Chaldeans, Armenians, and so on. Antiochenists accept the Pan-Syrianist approach, but only as the story of the ethnogenesis of the Syriac/Assyrian/Chaldean people. However, reject it as an attempt to force this identity upon all Syrians in the same manner that Arabism forces the Arab identity upon us all now. Furthermore, Antiochenists would point out that the Syrianist ideological theory, which includes the Hittites and Mitanni in the process of ethnogenesis is misleading. Nowhere in Syrianist-propaganda is non-Semitic heritage celebrated. Although the Hittites controlled portions of the Levant. They never inhabited the land. It was the Luwians that populated Hittite-control portions of the Levant. The very same people Antiochenists include in their ideological message of the ethnogenesis of the Levantine-Rûm (Antiochenes). As for the so-called acceptance of the Mitanni, Antiochenists would point out that if they are an accepted part of the Syrian ethnogenesis than why do Syrianists view their modern descendants, the Armenians, as immigrants  to Syria? The next major ideological difference between Pan-Syrianism and Antiochenism comes with their interpretation of just what is Natural Syria. Both agree that it is the geographic environment in which they Syrian people evolved, as well as the fact that it has distinct natural boundaries. The difference arises on just what those natural boundaries are. For the Syrianist, Natural Syria extends from “the Taurus range in the northwest and the Zagros mountains in the northeast to the Suez canal and the Red Sea in the south, and includes the Sinai peninsula and the gulf of Aqaba, and from the Syrian sea in the West, including the island of Cyprus, to the arch of the Arabian desert and the Persian gulf in the east ”. While for the Antiochenist, Natural Syria extends from the Taurus range in the northwest, and the Zagros Mountains in the northeast, to the Suez Canal and the Red Sea in the South, including the Sinai Peninsula, and from the Sea of the Rûm in the West, to the Syrian Desert in the east. The difference in this interpretation is that Syrianist base their concept of Natural Syria on the historical boundaries of the Neo-Assyrian Empire, and thus further reinforce their Semiticentric ideology. While Antiochenists base their interpretation on the historical boundaries of Seleukeia and the Roman/Byzantine Empire of which the Levantine-Rûm (Antiochenes) descend. All Secular Middle Eastern socio-political ideologies, including Pan-Syrianism, follow a tradition of forced cultural homogenization; in a misguided attempt to eliminate negative and divisionist aspects within Syrian society. 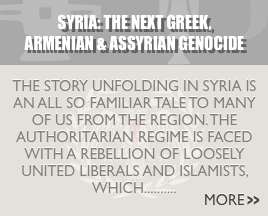 Hence the Sixth Basic Principle of Pan-Syrianism, “The Syrian nation is one society” . A noble idea, as a means to end the persecution of minorities, however, with Arabism it led to the forced Arabization of all. Pan-Syrianism is also guilty of this tradition, however, in place of Arabization there is forced Syriacization. In Antiochenism, this tradition is rejected. Yes, the Syrian nation is one society, but it mustn’t be forcefully homogenized in order to achieve equality and justice for all. The Syrian nation is made up of many ethnicities and cultural traditions which should be preserved and embraced. It is Syria’s diversity which gives it strengthen, and it mustn’t be sacrificed. In the end, the ideological differences between Pan-Syrianism and Antiochenism are huge. On one side, you have another Semiticentric ideology, which views our Greek and Roman ancestors as “invaders”, deHellenizes the regions heritage, and which has merely replaced Arabization with Syriacization. On the other hand is an ideology, which embraces our unique identity that traces its roots back to the Sea Peoples and Luwians of the Bronze Age. An ideology, which acknowledges its Hellenic origins, and wants to see the cycle of forced cultural, linguistic, and spiritual conversions end. Antiochenism does not see Pan-Syrianism as an “enemy”, as it does with Arabism. Instead, it views it as a purely Syriac-Nationalist Ideology, and an appropriate alternative for Syriac/Assyrian/Chaldean peoples. However, it does not accept it as a logical alternative for Levantine-Rûm. Antiochenism is an entirely revolutionary way of thinking for Levantine-Rûm. An ideology of cultural revival that taps into the regions Greco-Roman legacy, and indigenous heritage. An Alternative ideology, which no longer forces Rûm to adopt an alien identity in the name of acceptance and survival. It is the first alternative ideology, which is centered on a Romaic non-Semitic heritage, created for Rûm, by Rûm.